A mesmerizing new video showcases what the Earth looks like in infrared light – something that is invisible to the human eye but that nonetheless radiates from the planet’s surface constantly. Using images captured by two of NASA’s geostationary satellites, GOES 13 and GOES 15, University of Victoria graduate student James Tyrwhitt-Drake pieced them together to create an impressive timelapse. The video covers nearly two months of time, between November 30, 2014 and January 26, 2015. The resulting footage depicts infrared light as it is absorbed by the planet’s clouds and water vapor. The brighter a section looks in the video, the more infrared light is being blasted into space. 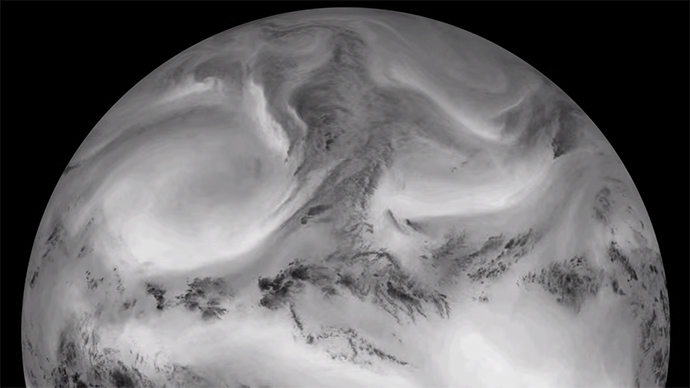 Amazingly, each second of the video’s imagery encompasses 21 hours of time on Earth. Another video of the phenomenon zooms in on Earth and focuses on its hemispheres, offering a closer look at the swirling infrared light. Notably, Tyrwhitt-Drake has a number of other videos highlighting views of the Earth from space, including some that show off city lights across countries like Portugal and Spain. One particularly impressive recording shows a timelapse of Earth in stunning 4K resolution. Tyrwhitt-Drake, who is studying advanced microscopy, also created a 4K timelapse video of the sun.